In honor of the Fourth of July, Crossroad Press is happy to offer a number of titles for only .99 – this is a limited time offer. These books will be available in digital from Kobo.com / Amazon.com / Barnes & Noble … links to each are below. In addition, we are offering 20% off the cover price of any print book through the Crossroad Press Online Store. Just use the code : 4THOFJULY at checkout. This offer is good from 3-July through 12-July 2014. You can browse the Print Editions we offer by visiting our Online Store and browsing the Print Editions category on the left side of the main page. 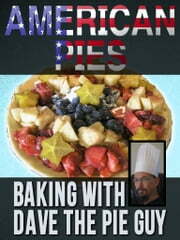 American Pies – Baking With Dave the Pie Guy – by David Niall Wilson (Featuring the 4th of July Friendly AMERICAN PIE recipe) – There was a time when pie was more important. Fat, fruit-stuffed confections lined the booths at state and county fairs, cooled in the windows of kitchens across the world, sprouted blackbirds in nursery rhymes and rose to iconic glory as a symbol of goodness and patriotism. That was then. Pies, as so many other things, have been in a slump for quite a while. This book – American Pies – is one man’s attempt to restore them to their former glory, at least for his family. Love Lost – by Patricia Lee Macomber – Amanda Stevens hasn’t had an easy life. Her parents are both dead. The only man she ever loved died before their wedding. She works a mundane job, lives in her childhood home, and hasn’t gone to a party since shoulder pads were in style. But all that is about to change. A single act of selflessness drives her out in her father’s old boat, late at night and in the middle of a storm. She’s on her way to rescue someone but when she lands in the past, she finds a new life, a new love, a new Amanda. The only problem is that she can’t stay, he can’t go, and if the war has anything to say about it, the island they’re marooned on will be wiped off the map. The James Bond Companion – By Raymond Benson – New digital edition of the classic 1980s Reference! The James Bond Bedside Companion was originally published in America in 1984. A second edition came out in 1986, and then an updated version was issued in both the U.S. and U.K. in 1988. The book went out of print in the early 1990s. Since then, the various editions have sold for big bucks on eBay and other resale outlets. In 2001, a firm produced an e-book and print-on-demand version of the book. The problem with that one was that none of the original plates existed. A facsimile had to be created from a scan of a copy of the book. At the time, scanner software wasn’t what it is today, so there were numerous, and sometimes laughable, errors in the text. For example, a word like “burns” was misread by the scanner as “bums!” (“Bond suffered multiple bums…”) Now, not quite thirty years after its original publication, comes a new and improved e-book, audiobook, and print edition of what many 007 fans have called, the author is humbled to say, a “Bond Bible.” Since its first appearance, numerous authors have published books on the James Bond phenomenon, mostly dealing with the films. In 1984, however, there wasn’t much out there that also dealt with the life of Ian Fleming and his novels. My book filled that gap for a time. Aliens in the Backyard – by Trish & Rob MacGregor – UFO Encounters, Abductions, & Synchronicity – In the early morning hours of March 28, 2011, Charles and Helene Fontaine experienced something that shattered their beliefs about the nature of reality. One evening in 1981, Connie J Cannon was on I-75 with her young son, en route to their new home in Florida, when they suddenly found themselves on a military base, with a man in uniform holding a gun to her head as three Grays stood nearby. In 1979, Diane Fine was on her way from upstate New York to Vermont to see an obstetrics specialist for her high risk pregnancy, and experienced two hours of missing time. When she was finally examined at the clinic, she was told wasn’t pregnant. In 1970, pilot Bruce Gernon was chased by something through the Bermuda Triangle and he has been talking about it ever since – to UFO Hunters, the Discovery Channel, National Geographic, the History Channel, the Sci-Fi channel, and all their foreign counterparts. These individuals have never met. But they share something significant. In 2003, a Roper Organization survey revealed that 33 million Americans may be abductees. Aliens in the Backyard is their story. Miraculous Journey – by Anne & Whitley Strieber – Is death really the end? Why do we fear death? As Anne Strieber faces this inevitable transition, she and her husband Whitley explore the deep meaning of this journey, and find in it a richness of meaning that is largely ignored by a society obsessed with avoiding death at all costs. In 2004, Anne Strieber had a brain hemorrhage that led, most recently, to a brain tumor that is of a type that is generally fatal. So now, after a long struggle, she faces death. Instead of turning away from it, Anne explores the miracle of life and the mystery that death represents. Is it an annihilating end, or a journey into a new kind of freedom? Whitley and Anne Strieber explore this question from the perspective of the love that illuminates their long marriage, and find that, in facing death, it is possible to find the true miracle of why we live our lives in the first place. Life is the miraculous journey, death at once an end and a joyous new beginning. Mafia Secret – by Angie Derek – Lessa Noelle grew up never knowing she was the illegitimate daughter of a mafia king pin. After his murder, she finds herself a surprise heiress immersed in the dangerous world of organized crime with only the guidance of Marco Santo her father’s second in command to help her. Marco searches for her father’s killer and tries to keep the realities of his life from touching her. An uneasy attraction blossoms between the two. An already dangerous situation turns volatile when a killer turns his attention to Lessa. Dead on the Island – by Bill Crider – A Truman Smith Mystery – PI Truman Smith has become a loner after failing to find his sister Jan during a recent search of Galveston Island. He jogs on the Seawall, plays with his cat, and reads lots of Faulkner books. He is pulled from his self-imposed retirement when his old high school football buddy Dino asks him to find a young girl named Sharon. As Tru begins his investigation, dead bodies begin to appear and Tru himself is attacked. His search for Sharon takes him to all sorts of interesting places on and near the Island. Bill Crider spins a good mystery tale in a wonderful setting with interesting characters and enough plot twists to keep readers guessing until the last few chapters. Grant Me Timely Grace – By Timothy J. Woods – Washington, D.C., June 1863. It is the week before Gettysburg, and the nation’s fate hangs in the balance. A Union officer was not court-martialed after disobeying a direct order during battle. Why? Major Russell Johns is being played by puppet-master, Gerard Chantier. Transplanted New Orleans businessman and toast of the town. Chantier hosts the city’s most lavish entertainments attended by members of Lincoln’s cabinet and Washington’s elite. Little do they know Gerard is coordinating an attack with Confederate general JEB Stuart’s cavalry to take over the city, kidnap Lincoln and bring victory to the South. When Russell’s probing brings him in contact with Chantier’s daughter, Thérèse, he has to face his most difficult moral choice: manipulating her to get to her father or honoring the one thing that has sustained him through years of battle and loss—his own integrity. A. P. B. by Dave Pedneau – A Whit Pynchon Mystery – Special investigator Whit Pynchon and crime reporter Annie Tyson-Tyree race against time to find the psychotic killer who is murdering the wives and girlfriends of all the cops in the small West Virginia town of Millbrook. Hawk Moon – By Rob MacGregor – Young Adult – Now that he’s back in Aspen, Colorado, Will Lansa feels like an outsider after spending the summer with his father on the Hopi reservation in Arizona. He breaks up with his girlfriend Myra, and then becomes the last person known to have seen her alive. When a missing knife is discovered with blood on the blade and traces of a drug on the handle, Will is suspected of committing the murder. His only allies are a computer hacker and a Hopi spirit who visits Will in his dreams. Haunted by visions of Myra’s death, Will won’t rest until he proves his innocence and finds Myra’s murderer. Midnight Eyes – by Sidney Williams – Men are being lured to agonizing deaths in the small Louisiana city of Aimsley. Brutalized bodies are displayed on the riverbank and in little-travelled bayou country, and a mysterious dark-eyed beauty may be connected. It’s a case with tremendous human suffering and a challenging political labyrinth for Sheriff Ty Hood. It means calling on the last person he wants to for help—his son. Former FBI agent Wayland Hood is a brilliant criminologist and writer. He’s immersed in a project to unravel the mysteries inside the minds of four of America’s most heinous serial killers. Only unresolved issues with his father can draw him into the dark quest for buried secrets that fuel modern bloodshed. As father and son clash with each other and with television reporter Jemy Reardon who has her own goals and theories, the body count increases. Only a terrifying excursion into the darkest heart of midnight can bring the nightmare to an end. Born Again – by Hans Holzer – From the Hans Holzer Digital Collection – his famed work on Reincarnation. -Authenticated case histories of “ordinary” Americans who have lived before: -Pamela Wollenberg, a twenty-year-old girl from Harvey, Illinois, in a previous incarnation the daughter of a Scottish nobleman, killed herself in a leap from the tower of her castle. -Ruth MacGuire, who now lives a peaceful life in an abandoned Inn in Connecticut, found memories under hypnosis of earlier lives as a Puritan girl dying of consumption before reaching America, and as a British officer’s wife, raped in a bloody Hindu uprising in India. -June Volpe was a belle of Atlanta before the Civil War and, as Elizabeth Simms, was killed by her son on a new plantation in Florida. She now lives the quiet life of a Pennsylvania housewife. These are just a few of those who have been… Born Again.